After only three hours of rest, the Flyer crew passed through Death Valley. They continued past Searles Lake which looked like a mass of caked snow. It was here the famous 20 mule teams hauled tons of Borax for processing as a detergent. The trail became increasingly better passing through the Mohave Desert, and finally rolling into Bakersfield well past midnight. It was the best day since leaving NYC with the Thomas covering 382 miles! 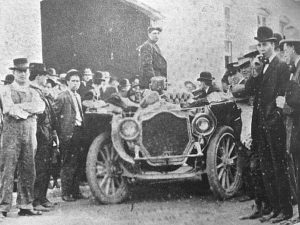 The photo below shows their departure the next morning, bound for San Francisco. Easy run this morning as we were able to get a relaxed 10 AM start from Ridgecrest bound for Bakersfield. Yesterday, two Navy jets approached us from the rear and made a pass so low I saw their shadow go over my hood! They might have been F/A-18E Super Hornets, but it’s hard to tell when all you could see was their afterburners…. Mary said she screamed having no idea what the thunder was, until they were just in front of the speedster. I’m sure the pilots based at the Naval Air Station in Ridgecrest had to laugh as they “attacked” our three “targets of opportunity” in a low level strafing run. Easy marks as they were 10 times faster than we were. Temps were “only” in the low 90’s, which almost seemed brisk compared to yesterday. 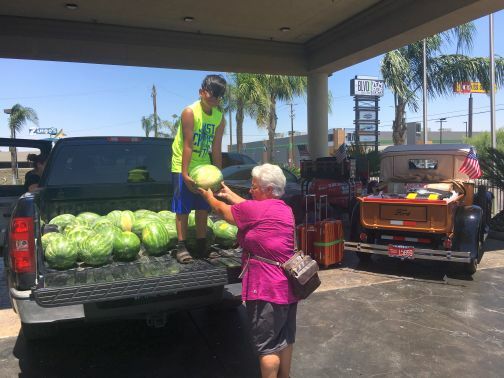 As we pulled into the hotel, an enterprising young fellow had a truckload of watermelons which his mother said were just picked this morning. How can you resist something like that? Our plan is to meet an old friend Rodney Rucker who we have known for years, and checkout the fireworks later tonight. Maybe, even have some watermelon (it doesn’t get any better that that on the 4th of July)!